MIT researchers made a huge upgrade to an instrument that’s indispensable in research today: the atomic force microscope (AFM). The AFM is one of the most versatile and powerful microscopy technology for studying samples at nanoscale or million times smaller than the width of a human hair. Despite it can zoom in and a capture even the tinniest and subtlest details of a surface, its main limitation is that it takes too long to scan. As such, it can only be used for static shots. Dynamic events, like chemical reactions, can’t be imaged with AFM. I mean, they can, but just like when you use a DSLR on high exposure to take a picture of a moving car, it will all be a mess. That’s set to change, as an upgraded version can scan samples 2,000 times faster — enough to image chemical reactions close to real time at 8 to 10 frames per second (real time is considered 30fps). The new instrument is based on the work of Iman Soltani Bozchalooi, now a postdoc at MIT’s Mechanical Engineering department, while still in his PhD days. A classical AFM works by measuring force between a probe (a sort of needle) and the sample. The probe skims past the probe slowly tracing its topography nanometer by nanometer, like a blind person might read Braille by using his fingers to feel embossed patterns and surfaces. To scan the sample, the AFM moves it across a platform laterally and vertically beneath the probe. The platform or scanner as it’s called has to move slowly, line by line, to image the whole surface of the sample. The new upgrade makes use of smaller platforms that image samples over a smaller area, but makes up in speed. The main innovation centers on a multiactuated scanner and its control: a sample platform incorporates a smaller, speedier scanner as well as a larger, slower scanner for every direction, which work together as one system to scan a wide 3D region at high speed. Of course, such attempts were made before but scientists couldn’t sync multiple scanners working together, so a single platform AFM that slowly, but steadily works has remained the norm for years. The MIT researchers solved this challenge by developing control algorithms that take into account the effect of one scanner on the other. MIT researchers demonstrated the new AFM by scanning a 70- by-70-micron sample of calcite as it was first immersed in deionized water and later exposed to sulfuric acid. Scientists could see the acid eating away at the calcite, expanding existing nanometer-sized pits in the material that quickly merged and led to a layer-by-layer removal of calcite along the material’s crystal pattern, over a period of several seconds. You couldn’t had possibly see this kind of chemical interaction with a simple AFM. 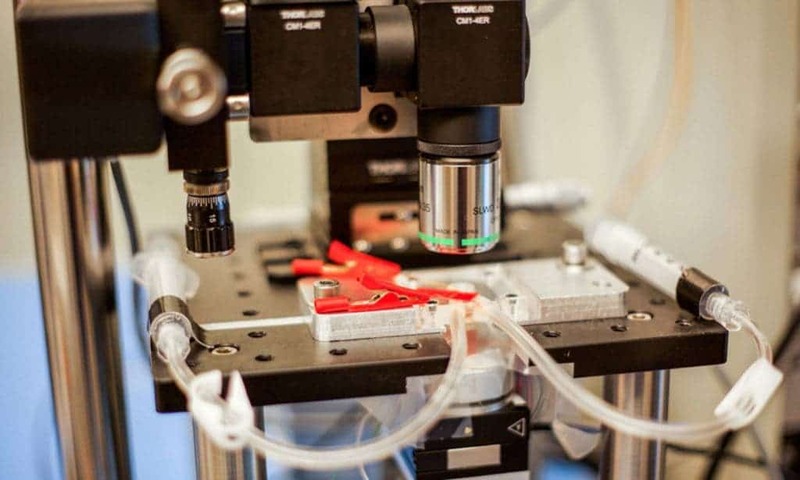 The device could help researchers visualize chemical reactions and trigger breakthroughs in fields like battery research, medicine and material science. MIT is thinking about speeding up the AFM even further. “We want to go to real video, which is at least 30 frames per second, Youcef-Toumi says.